The intent with this kit, is for those that have done all the bolt-ons, have exceeded stage II levels and are looking for the next level in performance. A turbo upgrade! Until now, choices were limited to an expensive Rotated Kit that may also require the use of accompanying rotated kit intercooler setup. Alternatively, a ‘Bolt-in’ turbo can be had for much less, but the turbine housings in these kits provide lower power output. Killer B Motorsport has designed the Spoolinator Turbo Kit, taking advantage of the performance oriented turbine housing, with the cost benefits of keeping the compressor in the stock location. 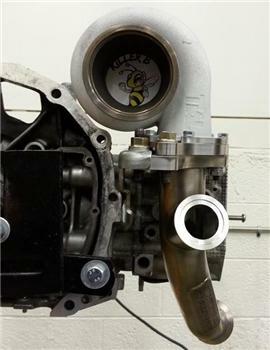 A Garrett GT/GTX28 to GT/GTX35R sized turbocharger must be used with this kit, with applicable compressor housings. Make no mistake, this kit does require a knowledgeable installer, post install custom tune, supporting modifications to be in place, and modification to your engine. The payback is the next level in performance for the best dollar spent, product value, bang-for-the-buck, etc. Warning! This kit is not for inexperienced installers. Modification are required and significantly higher power levels will be experienced.